I’m really getting low on French models, but I can still keep going for a little bit... Today we have another Matchbox car and trailer combo. This time the Water Police (or Water Rats in the local lingo). I’m just not sure which country (if any) is represented here. The UK I presume? Here, they actually do go around on their boats and breath test people on their pleasure craft, and yes, you do lose your drivers licence too if caught boating when drunk. 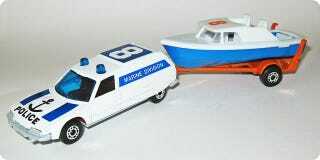 The Matchbox casting started off as an ambulance before being changed into this. I’m not sure if there are any other variations of it out there.